Boil and shell the eggs. See the instructions below. Once the eggs have been shelled and washed, slice eggs length wise. Carefully drop yokes into a small mixing bowl. Place egg whites on a serving dish. With a fork mash the yolks into a smooth crumb mixture. Add salt and pepper and mix. Add Miracle Whip and Mustard, then mix until smooth. Spoon yolk into the holes of the egg whites. Don’t over fill so you can ensure you have enough yoke to fill all the egg whites. If you have left over yolks, disperse it between all the eggs as evenly as possible. 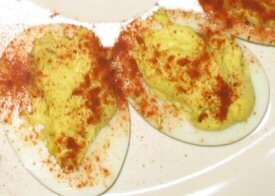 Sprinkle a desired amount of Paprika on each egg and serve. Every recipe has alternatives and deviled eggs are no different. Use plain mayonnaise instead of Miracle Whip to change the sweet tart flavor. Use 1½ tablespoons of mayonnaise and ½ tablespoon of white vinegar for a traditional southern flavor. You can replace the white vinegar with dill pickle juice. Dice your favorite pickles and add to the yoke mix before filling the shells. You can dice any vegetable for this, onions, tomatoes etc. You can use a piping bag to fill the egg whites instead of a spoon. That’s too much work for me. 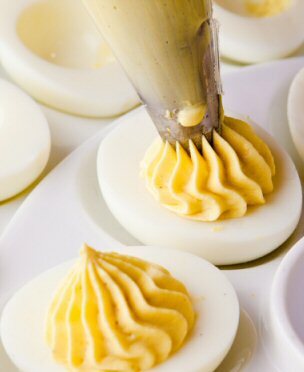 The biggest thing that can ruin a nice dish of deviled eggs are torn or rough shells. It also doesn’t help if the eggs cook the yoke on one side of the shell. So there’s a few things to know about fixing hard-boiled eggs. Before you begin the process of cooking, set the eggs out on the counter. Once the eggs are at room temperature, about an hour, place the eggs in a large pot with COLD water. There’s a few things to remember about this step. You don’t want to place the eggs in the pot like a pyramid. When they start boiling and crashing into each other, they can break the shells. Place the eggs on the bottom of the pot in 1 single layer. If that means cooking the eggs in batches, you’re better off doing that. Cover the eggs with water to about 1 inch over the eggs. Set the temperature on the stove to medium heat. When the eggs being to boil, add a teaspoon of salt and raise the temperature to medium-high. The salt will help your eggs float and roll around in the water, so they’ll cook more evenly. Cook the eggs at boiling for 20 minutes. Remove from heat and carefully pour off the hot water. Then cover the eggs with cold water and let stand for 10 to 15 minutes. You’re doing this not only to make it easier to handle, but cooling the eggs will also help to shrink the cooked whites inside and away from the shell. Making it easier to shell the eggs later. 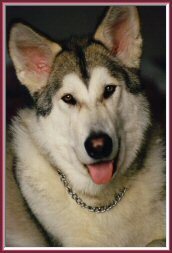 Once cooled, drain the water, then fill the pot with fresh cold water. Crack the shells and return the egg to soak in the cold water. Use a large table-spoon to help shell the eggs. Gently push the spoon under an opening in the shell and carefully turn the spoon around the egg. This will help separate the shell from the boiled egg inside. Wash any remaining shell off the egg and set the egg aside.